Ohio's Axemaster has been mucking it about in the American underground metal scene for some 30 years. Yet, it appears most of their recognition and success has come from overseas. 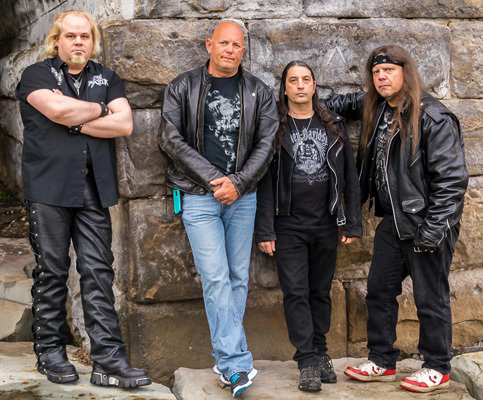 Through various trials and incarnations, the band, with guitarist Joe Simms the only original member, rises once more in 2015 with Overture To Madness, now signed to Germany's Pure Steel Records. Simply, Axemaster plays traditional heavy metal, like the American side of the New Wave of British Heavy Metal. 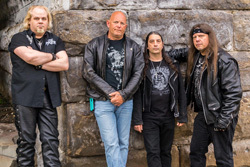 Their sound is touched by speed and thrash metal, making them as much a precursor to power metal. In it's entirety, the album is driven by Simms riffs and leads. They form the centerpiece with the rhythm section being both the glue and support. If you like strong guitar, specifically sharp and bold riffs accompanied by some massive solos, you'll like this album. 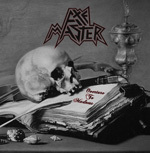 Additionally, Axemaster have a deeper and darker tone to their metal. The bottom end of their sound definitely puts the "heavy" into their metal, even while the riffs and leads can be spry and lively. While not necessarily drawing deep from the well of the doom metal genre, at times they seem to borrow from epic doom metal ala Candlemass. The lyrical content seems to steer towards horror and other sinister things. Vocalist Geoff McGraw articulates these things with the snarling sneer of a sinister gruff voice. Unfortunately, this also makes him difficult to understand. If the CD comes with a lyric sheet, you'll neeed it. All this adds up to a very consistent and persistent sound for Axemaster. There's not much deviation from the pattern and, in this sense, some may call it redundant. If anything, with Overture To Madness, there's a lot of heavy metal here, nearly one hour. Which makes me wonder, thinking of their history, if this album couldn't have been cut back a traditional LP length. Nevertheless, for the reasons above, if you like classic American heavy metal, especially with a deeper sound and sharp guitars, you'll dig Overture To Madness. If you like classic American heavy metal, especially with a deeper sound and sharp guitars, you'll dig Axemaster's Overture To Madness.